Movie Edit Pro 14 Plus is digital video-editing software that lets you create great movies easily. Movie Pro 14 is meant to serve as the family video editor by giving you lots of ways to enhance your home videos and export them to various formats, including iPod video and PSP. Movie Pro 14 Plus sets new standards in movie editing and is the all-round solution for users with high demands. Movie Pro 14 is the only video editing software to include Reallusion iClone 2SE, the animation program. Movie Pro 14 has the potential to become a strong editing program, especially with its wide variety of titles and effects. Movie Pro 14 works well and offers great value for the money. Movie Pro 14 offers you more than any other comparable video-editing program. This all-around solution really impresses with high-performance and precise editing tools, storyboards, timelines, voice tracks, title tracks, music tracks and numerous overlay tracks. All make video editing a far cry from the ease of editing a simple photograph. Video editing can be a brilliant hobby once you’ve mastered a few moves and there’s without doubt a lot to like about Edit Pro Plus 14. 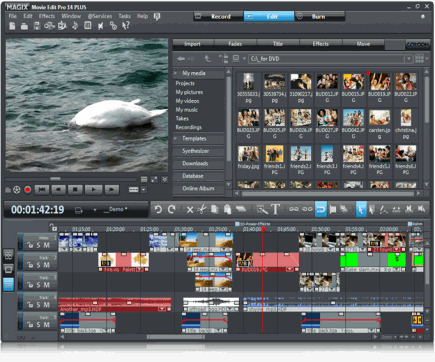 MAGIX Movie Edit Pro 14 PLUS unites highly precise video editing tools with advanced surround dubbing and individually adjustable special effects. Movie Pro 14 already offers the complete workflow for HD material. HD recordings can be imported directly, conveniently edited, and then exported in all conventional formats. 3D real-time animation with iClone2 SE The ideal complement for MAGIX Movie Edit Pro 14 PLUS: With advanced character design and amazingly convincing real-time video effects you can add speaking characters, 3D scenes and cinematic special effects. "There's no denying that Movie Edit Pro 14 Plus is excellent value for money at $49.99 USD, especially compared to Adobe's Premiere Elements and Pinnacle's Studio prices. You are in the director's chair! If you don't want your recordings to be edited automatically, youcan adjust all special effects, fades, and music any way you see fit. With various ways to changethe settings and professional control elements, your PC can turn into a complete video studio ina flash. ● Transfer to mobile video player in top quality and the right format. ● Transfer videos and slideshows to digital frames with sound. ● Present as a HD show with menus in your free MAGIX Online Album or upload to YouTubeTM as a web-optimized video. Movie Edit Pro 14 PLUS With the integrated Dolby Digital 5.1 Creator (feebasedplug-in purchase required) you can putyour videos into a new sound dimension. You canassign sound effects to characters in space or letsounds fly through the room from oneloudspeaker to the other. Just like at the movies!With Dolby® Digital 5.1 Creator the sound in yourmovies will be just as captivating as the video! Movie Edit Pro 14 PLUS is the optimalsolution if you want to easily edit HD videos: allcommon HD video formats can be imported,optimized, and dubbed in no time at all, burned asa HD DVD disc, and presented on TV or online!Razor sharp, professional results guaranteed! The ideal complement for Movie Edit Pro14 PLUS: With advanced character design andamazingly convincing real-time video effects youcan add speaking characters, 3D scenes andcinematic special effects. Turn photos intounbelievably real persons! Even complexmovement sequences and choreographed scenescan be easily realized using iClone 2.0 SE. Create excitement! The professional templates forpicture-ion-picture animations make for impressivespecial effects in each video. Simply drag selectedvideos into the additional video tracks, determine thesequence and enjoy the show! While the main videois playing in the background, the additional video willbe faded in over it –just like its is done on TV during live broadcasts orinterviews. Would you like to be able to capture videos thatyou see on your monitor? Movie Edit Pro 14 PLUS can do this easily! The smart screen capturingtechnology lets you record Internet videos duringplayback and use them in your projects aftersaving as a file. Do you have video recordings that are notseparated into individual scenes? With the new,improved scene recognition it's easy to do thisretroactively, too. Movie Edit Pro 14 PLUSscans the time code and recognizes pauses in therecording, marking these automatically asindividual scenes to help you comfortablynavigate through your video recordings. Would you like to play back your DVD project onthe PC without having to start Movie Edit Pro 14 PLUS orhaving to burn an extra DVD? Simply export yourproject as a high-resolution PC show, which canbe playback any time – as a regular video. Thisway you can present intermediate results of yourwork to your audience! Movie Edit Pro 14 PLUS can now integrate downloadedvideos, photos and music from the Internet intoyour video project. For example, integrate adspots or movie trailers into your project. Thecomprehensive support for all common mediaformats lets your creativity know no bounds. Do you want to process multiple video files intoanother format in one go? No problem! Mark asmany files in a folder as you want with thecomfortable batch processing feature and startconversion. The selected videos will be convertedinto the desired format completely automaticallyone after the other. This way, you'll have moretime left for watching! With MAGIX Movie Edit Pro 14 PLUS you can turnyour games console into a digital video player:simply export your videos in a format supported byyour console and enjoy your videos in the highestquality on your TV! You'll find everything you need right here! A giantdownload archive of high-quality media offerseverything you could ever desire – including usefulpreview function for all files. Enrich your mediaprojects with arty DVD menus, moody backgroundmusic, exclusive sounds, photos, videos, andmuch more.NEW! Sell your media on Catooh: Simply register,upload media, and earn money! Integrated live user chat offers you the possibilityto exchange with other users immediately andwithout time delay. Just launch the communicator,enter your question, and wait for the answeronline. If that doesn't help, then take a look at the newonline knowledge portal: Lots of topics, even moreinfo, even more knowledge!